The birthstone for the month of May, the emerald is known for its enchanting color, which reflects the vibrancy of spring. 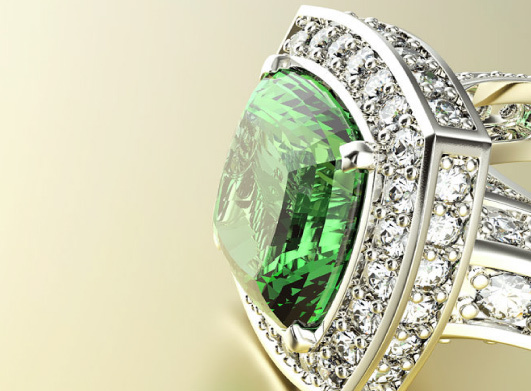 Famously a favorite of Cleopatra, the emerald was thought to have mystical powers and represented fertility and youth. One of the four precious gemstones, the emerald is a beryl with a hardness of 7.5-8 on the Mohs scale. Unlike many other gemstones, the emerald is known for having inclusions and fissures visible to the naked eye. Natural emeralds with no visible inclusions are very rare and therefore very expensive. Emerald jewelry is often set in yellow gold, as the warm tones of yellow gold are a perfect match to enhance the rich green of emeralds. Stop in and see some of the gorgeous emerald jewelry we have in store today!